�do lib�r pune p�rmban 13 m�sime t� p�rjav�shme. 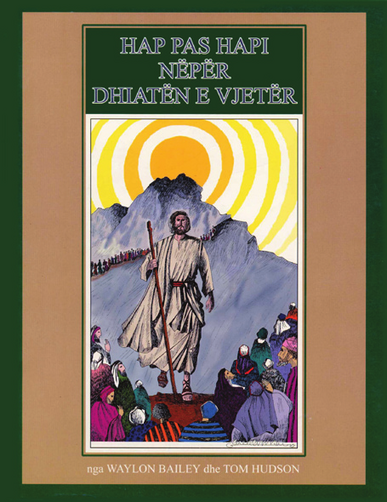 Ju do t� studioni Testamentet e Vjet�r dhe t� Ri br�nda kontekstit t� gjeografis�, historis� dhe t� kultur�s. Librat e pun�s p�rmbajn� aktivitete m�simore n� lidhje me jet�n. K�ta libra pune jan� mjaft efektiv� kur p�rdoren n� grupe t� vogla studimi, por mund t� jen� edhe baz� p�r nj� studim personal gjithashtu. Nga , 216 faqe, botuar ne shqip nga Southern Baptist Convention (Bordi Nd�rkomb�tar Misioni) ? Each workbook contains 13 weekly lessons.You will study the Old and New Testaments within the context of geography, history and culture. The workbooks contain life related learning activities. These workbooks are most effective when used in small group studies, but can also be the basis for a personal study.